Jakarta, May 30, 2017 – PT. Puradelta Lestari Tbk. (“DMAS”) and PanaHome Asia Pacific Pte. 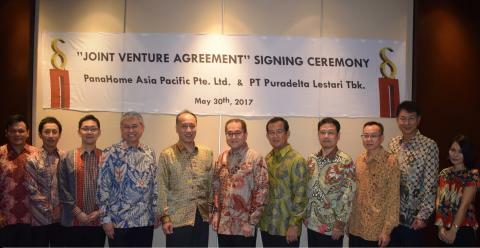 Ltd. (“PanaHome”) today enter into agreement to establish a joint venture company of PT. PanaHome Deltamas Indonesia (“PanaHome Deltamas”) with the aim of building residential estate with sustainable smart town concept within Kota Deltamas, which is an integrated township of industrial, commercial, and residential, developed by PT Puradelta Lestari Tbk. in Cikarang, Bekasi Regency, West Java, Indonesia. 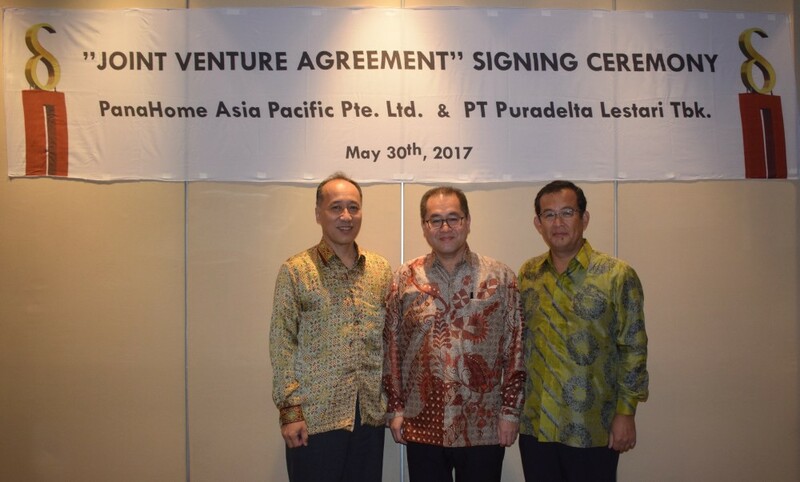 PanaHome Deltamas will be established as a joint venture with equity interest split 51% to PT PanaHome Gobel Indonesia, a PanaHome’s consolidated subsidiary, and 49% to DMAS. PanaHome Deltamas will pursue housing development by combining DMAS’s concept of creating a residential neighborhood proximal to business districts in Kota Deltamas area and PanaHome’s expertise in building sustainable smart towns in Japan. PanaHome Deltamas aims to create a safe, convenient, and comfortable housing that provides a balanced and prosperous lifestyle. The total value of the development project by PanaHome Deltamas is estimated around Rp 3 trillion for project development until year of 2026. PT Puradelta Lestari Tbk. (DMAS) is an integrated township developer of Kota Deltamas, located in Central Cikarang, with total development area up to 3,200 hectares. Kota Deltamas is a prime township at east of Jakarta with strategic location, wide land bank, direct toll access, and equipped with comprehensive facilities and infrastructures. DMAS continues to develop its world class infrastructures to support its self-sustained integrated township, consists of industrial, residential, and commercial area, and extend its facilities to assure life quality of all workforce in the industrial area, residents, and its surrounding community. Majority and controlling shareholders of PT Puradelta Lestari Tbk. are both Sinar Mas Land (57.28%), a prominent property developer in Indonesia, and Sojitz Corporation (25.00%), a Japanese general trading company with network in over 50 countries in the world. PanaHome Asia Pacific Pte. Ltd. (“PanaHome”) is a housing company under the Panasonic Group that has been in business for more than 50 years, and has built a total of approximately 480,000 homes across Japan. PanaHome is also actively expanding its business overseas, beginning with Taiwan in 2010 and Malaysia in 2012. In 2016, PanaHome has signed a partnership agreement with PT. Gobel International to establish its subsidiary in Indonesia, under the name of PT. PanaHome Gobel Indonesia.